Other Conferences, Seminars and Symposiums Related to Living History / Agricultural History/ Outdoor Museums Etc. Description: We all know it’s the outfit that makes the man, but it’s the details that makes the outfit! At our first Maker's Conference, immerse yourself in the craftsmanship of period embroidery while learning more about the techniques, symbolism, and attitudes surrounding 17th-century clothing embellishment. The Maker’s Conference will primarily focus on embroidery, a common embellishment technique that would have been both familiar and lavish to the middling sort of the 17th century. During the course of the weekend, you will design and execute an embroidery hoop wall hanging, using period techniques and motifs. The hands-on embroidery workshops will be supplemented with programs that explore further aspects of 17th-century design. Peek behind the scenes at our Colonial Wardrobe shop, and get up close and personal with some of the embellished clothing that has been used in the English Village over the past fifty years. Learn more about what accessories could symbolize in daily life, by exploring the common artifacts of a period wedding. Spend time with a Native craftsperson about embellishing traditional clothing at the Wampanoag Homesite. Observe a lace-making demonstration, learn to create your own thread-wrapped buttons, and stamp delicate spangles that would catch the light in a glimmering 17th-century ballroom. And of course, don’t miss a chance to experience the Plimoth Embroidered Jacket, a reproduction embroidered jacket based on two pieces in the Victoria and Albert Museum in London. The jacket was completed in 2009 with the diligent work of volunteer hand-embroiders, but has only been on display selectively. Whether you are an embroidery enthusiast, a hobbyist looking to improve your skills or expand your time period, or simply interested in the glitz and glamour of an era that often seems anything but, this first-ever Maker’s Conference is a gathering not to be missed! Join Virginia Cooperative Extension, The Livestock Conservancy and heritage livestock experts for a two-day intensive workshop that will help inform today’s veterans to become tomorrow’s successful farmers! Come to Jamestown Settlement June 24-26, 2016 for a weekend focused on the study and re-creation of late 16th and early 17th century clothing. 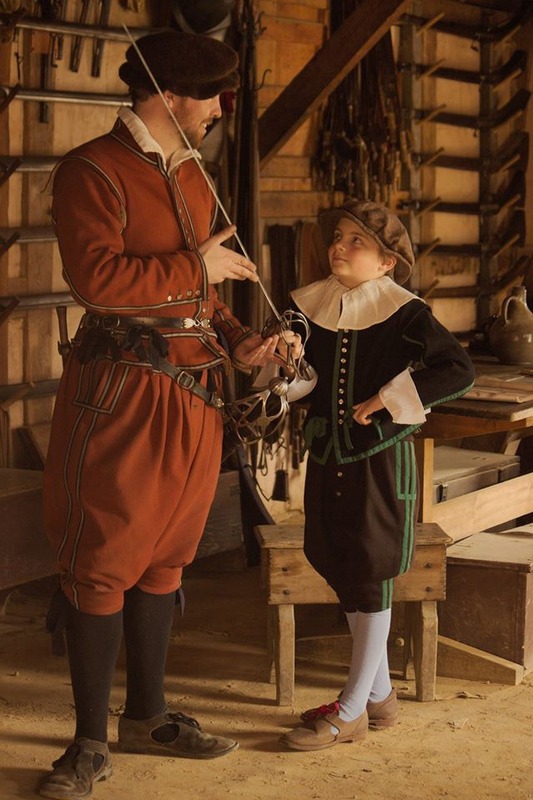 “Tailored to a New World” brings together The Tudor Tailor team from England and historical clothing scholars from around the United States for a conference that includes hands-on workshops as well as lectures. Participants will also enjoy field trips, behind-the-scenes tours, and an evening reception in the recreated James Fort. Registration opens December 1, 2015 and is limited to 72 participants. Got milk? There aren’t many options for providing you and your family with fresh milk. An option many use is getting involved with a cow or goat share. Keeping your own dairy animals is becoming increasingly popular. Still, the idea of keeping and caring for your own dairy animals can be a daunting proposition. Not to mention the need to milk daily! This introductory course in keeping a home dairy will touch on animal choice (goat, cow, or sheep), care and management of the animals, milk and milk products production, rules and regulations to consider as well as personal stories to help you choose the right dairying set up for you. Please join us at our farm(s) as we demonstrate our home dairy. We will provide a solid foundation from which you can build yours. This class will start at Tillers Cook’s Mill facility, lunch will be provided there and we will then finish at another farm. An upcoming symposium sponsored by The New England Flax & Linen Study Group in collaboration with Historic Deerfield. And please help spread the word by forwarding to your friends/colleagues! "Wake the Past With a Kiss: Communicating With Visitors Through Museum Theatre"
The 2016 IMTAL European Regional Conference consists of three exciting days full of panel discussions, performances, and workshop sessions that explore the conference theme: "Wake the Past With a Kiss: Communicating With Visitors Through Museum Theatre". IMTAL Europe invites you to share and compare the variety of tools and approaches in the field of museum theatre. Come to late medieval Altpernstein Castle in the picturesque Krems Valley to learn how your colleagues use new and well-tried methods of verbal and non-verbal communication to get a complex message out to the audience in a digital age. The 2016 conference will feature international keynote speakers, workshops and panels of speakers dealing with the theory and practice of communication in museum theatre, re-enactment, storytelling and live interpretation, and visits to local museums and historic sites. It will bring together practitioners, researchers, performers and museum professionals from around Europe (and the World) to discuss, debate, present and, share examples of how the field is evolving and innovating. Proposals may address any facet of the theory and practice of museum theatre, living history, re-enactment, storytelling and live interpretation. Panel Discussion (60-90 minutes): Two or more presenters on similar topics that may or may not have a moderator. Skills Workshop (60-120 minutes): Interactive sessions presented by individuals or groups and focused on learning practical skills used in museum theatre such as script writing, costume, prop or puppet creation, acting technique, evaluation, creative dramatics, grant writing, participatory theatre etc.. Performance with Discussion (60-120 minutes): A performance of a museum theatre work followed by a discussion to provide more in-depth understanding of the goals and objectives of the work or details of the development of the work. Ancient Roman and military performances of all kinds are especially welcome since we are visiting the Roman site Carnuntum and the National Army Museum in Vienna. Pecha Kucha Style Presentation: Presenters have six minutes and forty seconds each to share up to 20 slides on a paper, project, performance, or idea related to their research or work in the field of museum theatre. Several of these presentations will be combined into one session. Especially suitable for students and their projects. Posters: Poster presentations will be held in a separate poster session. All presenters will be at this session, and have the opportunity to discuss their work with conference delegates. Posters are an excellent way to present new concepts, ideas, and programs. Please submit proposals by January 15th, 2016 to i.glueckler@ku-linz.at. Proposals should include: session type, session title, 80 word summary (to be used by the review committee and in the program guide), staging and AV needs, any additional support materials (performance video, script, etc. ), and contact information. All sessions will be published in a follow-up publication in a special issue of Insights Europe 1-2017. Note that all presenters must register for the conference by May 15th, 2016 for your session to be confirmed.